NBC’s ‘Office’ Spinoff Starring Dwight Not Happening After All!!! Remember that spin-off ‘Office‘ series we have been talking about for the last few months on here? You can catch up HERE. Well it seems that the Dwight Schrute centric series, ‘The Farm’ is no longer on the table, meaning that the series finale of ‘The Office’ next year will be the last we see of Dunder Mifflin and its employees. It’s a strange decision by NBC, which they are keeping quiet about, but to cancel something that hasn’t even aired yet is a bit weird. Hopefully more info comes available soon. 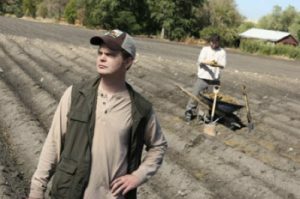 I was actually looking forward to a Dwight centric series where he lived on the Schrute beet farm and bed and breakfast. This could have been great. ‘The Office’ Getting a Spinoff Series Starring Dwight Schrute!?!?!? Roseanne Barr Will Guest on NBC’s ‘The Office’!!! This entry was posted on Tuesday, October 30th, 2012 at 11:00 am	and is filed under News, Television. You can follow any responses to this entry through the RSS 2.0 feed. You can skip to the end and leave a response. Pinging is currently not allowed. « Geek Deal of the Day! ‘Indiana Jones’ Complete Blu-ray Movie Set 50% Off!!! Leave it to Ox to write a riddle in a dead language.